One Eternal Day: "Render unto Caesar...."
For me election night is like the Super Bowl and the election season leading up to it interests me the way the NFL interests others. Politics and political issues have fascinated me since I was young and political science became my primary course of study. I taught classes about politics, political parties, and government for thirty-five years. It isn't always easy to keep things in proportion. Collin Hansen writes "When I struggled several years ago to distinguish between my theological beliefs and convictions on such matters as tax policy and federal bureaucracy, I needed an oasis where I could escape the withering heat of political campaigning. 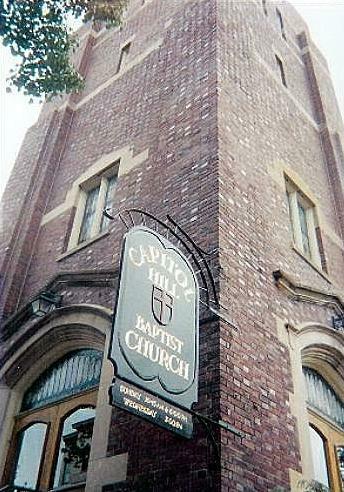 I found it in the community of Capitol Hill Baptist Church. Only here did I associate with anyone from the other party. Only here did I hear a message that would endure forever, long after everyone had forgotten any press releases or speeches I wrote." The pastor at Capitol Hill Baptist is Mark Dever and Hansen describes a recent sermon of his as the "best sermon I know on Christianity and government." You can listen to the sermon here. What follows is from Hansen's summary of Dever's "Jesus Paid Taxes," based on Mark 12:13-17. .... Jesus sets out a novel, revolutionary philosophy in these five verses, Dever argued. By way of background on this confrontation between Jesus and his religious opponents, Dever explained that Jesus posed such a great threat to Jewish leaders that he united bitter enemies from among the Herodians, who conspired with Rome, and the Pharisees, who rebelled against Israel’s occupiers. Together, they approached Jesus, hoping to catch him in a trap. They asked, “Is it lawful to pay taxes to Caesar, or not? Should we pay them, or should we not?” (Mark 12:14) By answering, Jesus was in danger of losing either his popularity or his life. In fact, he lost both after a shocking response that subsequently formed the basis for all Western political philosophy. In his first of three main points, Dever said Christians are good citizens. Though Jesus later suffered the vengeance of his enemies, he actually escaped the rhetorical noose with his answer here. Jesus regarded the pagan state as legitimate when he said, “Render to Caesar the things that are Caesar’s” (Mark 12:17). The answer stunned the Herodians and Pharisees, because whatever their differences, Israel and Rome both derived their legitimacy by divine appeals. With his third and final point, Dever argued that Christians are finally accountable to God. Many remember that Jesus told the Pharisees and Heroadians, “Render to Caesar the things that are Caesar’s.” Not so many remember that Jesus ended his teaching by saying we should render “to God the things that are God’s” (Mark 12:17). While Jesus commanded obedience to the state, he undermined its final authority with this phrase. The type of denarius Jesus requested to see bore an inscription: “Augustus Tiberius, son of the divine Augustus.” Jesus may have called for obedience, but he flatly rejected all such worship of Roman emperors. Thus, our duty to earthly authority is limited, Dever taught, a fact that becomes clear when authorities clash.